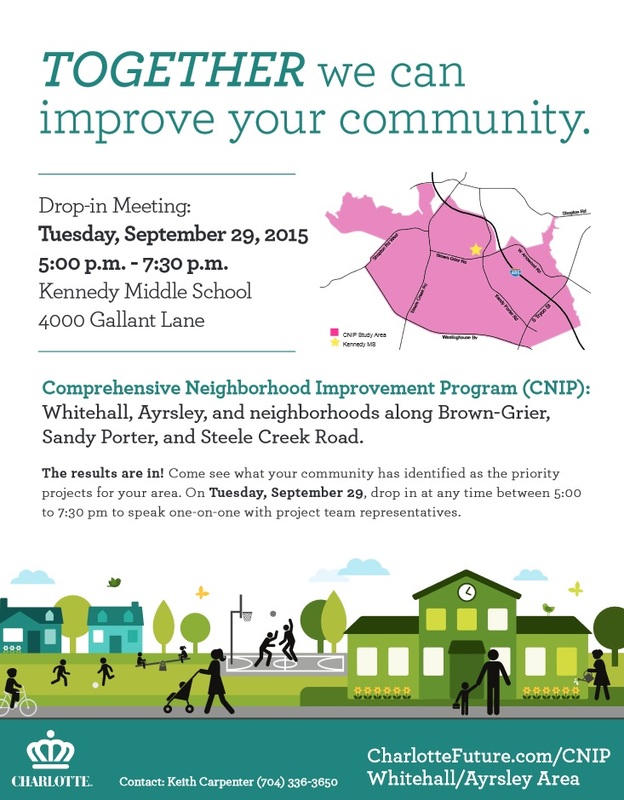 (September 21, 2015) Charlotte city staff and consultants will be holding the third public meeting on the Whitehall/Ayrsley Comprehensive Neighborhood Improvement Program (CNIP) on Tuesday, September 29 from 5:00 to 7:30 PM at Kennedy Middle School. This will be a drop in meeting where neighbors can view the latest list of priority projects for the Whitehall/Ayrsley CNIP area and speak one-on-one with project team representatives. Charlotte has identified five neighborhoods across the city where it plans to make strategic investments to address a broad array of community needs. One of these is designated "Whitehall/Ayrsley." It covers areas of northern Steele Creek located between I-485 and Westinghouse Boulevard. In addition to Whitehall and Ayrsley, it includes parts of Berewick and neighborhoods along Brown-Grier Road, Sandy Porter Road, and Steele Creek Road. Over the next several years, the city will plan, design, and implement $120 million in proposed community improvements in these five areas, including $30 million in the Whitehall-Ayrsley target area. At the first neighborhood meeting in March, residents marked up maps with notes and stickers to identify areas where improvements to roads, intersections, sidewalks, trails, parks, and other infrastructure are needed. See Annotated Maps from the Whitehall/Ayrsley Community Meeting. At the second community meeting in April, project representatives presented a list of 59 potential projects and asked attendees to identify the 10 that they believed were the most important. This list is not available on the CNIP web pages. A version of this list was provided through the Go Ayrsley Facebook page here: Go Ayrsley Survey. but this survey only included 57 projects. The S. Tryon Street/Sandy Porter Road intersection and at least one other project are missing from the Ayrsley survey list. Many of the needs identified at the March meeting are not the city's responsibility but would need to be completed through state, county, or private initiatives. Although these projects are not part of the CNIP, city staff may be able to work with other governments or private entities to expedite them. The results of the April survey will be available at the September 29 drop in meeting.